Looking for the best Dog Walking trails around Spearfish? 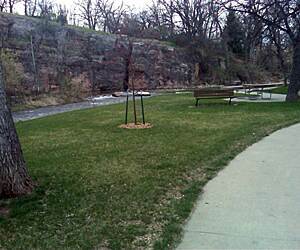 Find the top rated dog walking trails in Spearfish, whether you're looking for an easy short dog walking trail or a long dog walking trail, you'll find what you're looking for. Click on a dog walking trail below to find trail descriptions, trail maps, photos, and reviews. I loved this trail. My wife, daughter, and I took a summer camping trip to Custer and the Black Hills. I was very interested in the trail after watching videos, seeing pictures, and reading about it. My wife was unable to ride bikes due to some injury so I studied the elevation chart and had her drop me off at the higher trail heads and pick me up at the low ones. If you are a wana-be bike rider that is all for the coasting and none of the labor of going up hill, I highly recommend this method - if you have someone that is not up for riding. OR like we did once my sister joined us, have two cars with one at each end. Then just coast from one to the other. Some of the most beautiful scenery ever. Bison at a few points beside the trail and other wildlife to see. There are several places the trail passes through ranches and sometimes there were cows on the trail. It was never a problem. The cows didn't pay much mind to us. There were gates to open and close, but again, not a problem. Loads of history with nice trail heads and rest stops that give in-depth descriptions of the history. It was almost enough to make me want to move to the Black Hills of South Dakota. From Texas-Went to trail twice last summer- due to weather issues. Started at Edgemont the first time. Did not like the constant incline for 43 miles. So when we went back the seecond time, we left our car in Edgemont, bought a ride to Deadwood and started from there. It was 17 miles uphill to start but than a 10 mile decent. Up and down like this until last 43 miles where it mostly descends until one last big uphill at the 5-6 mile marker. I will go back again. Husband said he would love to get electric bikes and do it. Took our tent and camped were we could. I went with a group from Road Scholar which provided a SAG van & divided the trail into 4 sections in 4 days. Overall it is very scenic . Be very careful heading south from Pringle to Edgemont as there is a lot of loose sand on the trail. There are some steep prolonged hills, I did 4 miles from Mystic south with the front sprocket in1 and the rear switching between 1 & 2,quite a hill for a 70 yr old guy from NJ. Dress in layers and drink plenty of water, refills are available from cisterns at trail heads. Be aware that parts of the trail are over 6000 ft, give yourself a day to adjust before doing the steep grades. The tail is very well marked and easy to follow but that is about all that is easy, for a recumbent rider at least. I had some chain issues on the first day and thankfully we started in Deadwood. That meant the closest bike shop was 15 miles away in Spearfish, Rushmore Sports. The trip was delayed by a day and we started in Custer to Hot Springs. Mostly downhill but the trail material packed gravel and it is slow! Hot Springs required 11 miles on the highway with a good sized hill into town. Next we hired a shuttle to the Dumont trailhead. This section is by far the most scenic and 18 miles downhill to Hill City but there are 2 long (7 & 10 mile) slow climbs from there to Custer. Finally we drove to Edgemont and rode north to the HghWy 18 trailhead. Again it is a shallow grade hill but it is slow going. NOTE the trail has MANY washouts where it is deeply rutted across the path with deep, loose sand which make going up even slower and going down, at speed, really hairy. 2 day ride starting in Deadwood, overnight in Hill City and on to Edgemont. Outstanding fall ride with a total of 8 other riders over 2 days. Mornings were cold but afternoons were into the 60s. Snow still present in N and NW facing slopes with the trail muddy in spots. Day 1 surface was firmer with smaller packed gravel. Rode 28mm tires and was fine all day. Day 2 changed to 35mm tires and found it helpful dealing with the freeze thaw mud. Overall one of the best R2T rides I have done. Trail maintenance and facilities were excellent! This is the sort of R2T other states should use as an example. I did a 40 mile round trip on a hybrid, starting at Hill City. A local rider told me this was the nicest stretch of the trail. It took me through three of the four tunnels. Once you leave the Hill City outskirts, you're away from the highway and riding through some beautiful scenery. This is a more challenging ride that most rail trails. The hills aren't steep, but they're long. Going north, you climb a long hill out of Hill City, reach a crest and then descend 7 miles before starting up and even longer hill. It's hard to imagine a better managed trail than this. The the signage, the condition of the trail surface and the rest facilities are all excellent. The guys who built this put a lot of thought and effort into it. Highly recommended. With a free day during our dude’s trip “Out West”, we snagged the chance to ride 33 miles from Dumont to Hill City. We rented our hybrid bikes at the first-rate, family owned rental company in Hill City. Our guide took us via the “backroads” route to Dumont where she entertained us with trail stories and local history…. what a great start! Dumont’s TH was nicely unassuming with clean restrooms & potable water. We crossed the road and started our southerly journey 18-mile downhill. This section of the trail was our favorite. We wound through the valleys of fragrant wildflowers, tall dark pines, gently running streams and exposed rocky slopes. Our lunch stop was by Rochford’s TH which is south of the town across from the fire department. We switchbacked up to the Rochford Mall (a must stop) for a meal of pre-packaged sandwiches, frozen burritos and some cold sodas. Continuing downhill we crossed the signature trestle over Rapid Creek but we knew the good times were going to end and it did at the Mystic TH. The uphill grade is gentle and doable but there are no flat recovery sections, but you can stop “to take pictures” at Tunnels A & B. 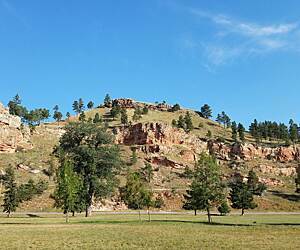 After the “real” summit, the trial runs downhill through prairie-like areas toward Hill City. Note: at the intersection of E. Main Street, cross the street and ride the Walnut Ave. sidewalk in front of the railroad museum until you re-enter the trail behind the Quality Inn. When you finish, hang around Hill City where you can goof around for a while and enjoy a well-earned drink & meal at one of their many fine restaurants. 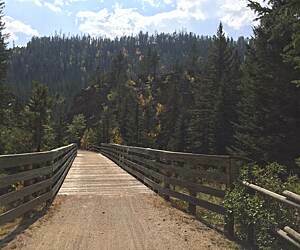 My wife and I bikepacked the trail from Deadwood to Edgemont. We took two days with a camp stop at Crooked Creek RV Park in Hill City. (We had planned to use the Oreville Forest Service campgroud, but Crooked Creek is right on the trail and, since it was unseasonably warm, the prospect of using the shower was too good to pass up.) Stopping there made the first day about 50 miles and the second 59 miles. The Mickelson Trail is terrific. We most liked the sections away from roads, but even when the trail is close to roads it is so much more relaxing than riding on the shoulder. The surface is mostly pretty firm although it rained hard the night we spent in Hill City and there were a few placed that had washed a little, but it was no problem. We were in bikepacking mode and carried too much water. The periodic trail heads and rest shelters are great for stretch and snack stops. In all, a great experience and a great trail. Another great section starting from Mystic trailhead. Nice scenery, tunnel, including a great little falls to explore. Mystic trailhead has a bike tool air station which we thought was pretty darn nice to provide. Something we've only seen along Urban trails. Thank You SD for a great experience.